Typically people associate Hong Kong with packed, urban city-life, but by venturing a little off the beaten path you can see some beautiful wilderness. Check out some of the wilder places I saw in Hong Kong that aren’t to be missed below. The past week was pretty amazing weather-wise. 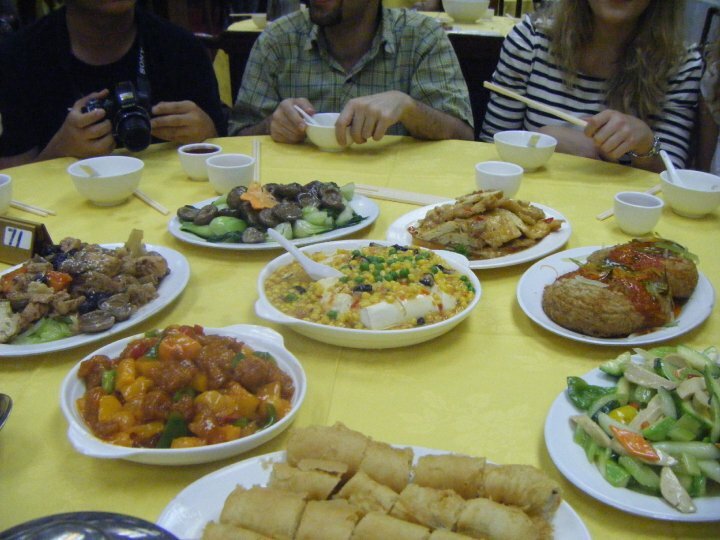 I accomplished so many of my must-do things in Hong Kong that weekend and it was great! Let’s see where I last left off. Friday the fun really began. I went to Lok Fu that afternoon to meet an exchange friend I’d made in LKF two weeks prior attending Hong Kong Baptist University (his home university was in Melbourne). We met up and the first place we went was Kowloon Walled City Park, which was in the heart of the city, but once you entered the park, it felt like you’d stepped into a tranquil garden. We saw a man doing tai chi with a sword, we saw beautiful pagodas and placid ponds and we stumbled upon a historical Chinese drama television show being filmed in the park! At first, we couldn’t understand why these people were all sitting around dressed in matching, old-school outfits, then as we rounded a corner, the camera equipment, crew and other more prominent actors came into view. The first people we saw were extras “taking five” while the shot was being set up and the key actors were touched up. Cool. Who knew they could actually film a period drama in ultra-modern Hong Kong and not some sound stage in China. 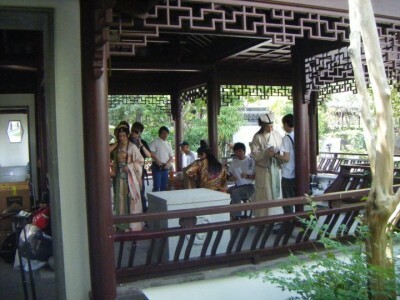 A shot of the Chinese period drama we stumbled upon in Kowloon Park. Places everyone, places! 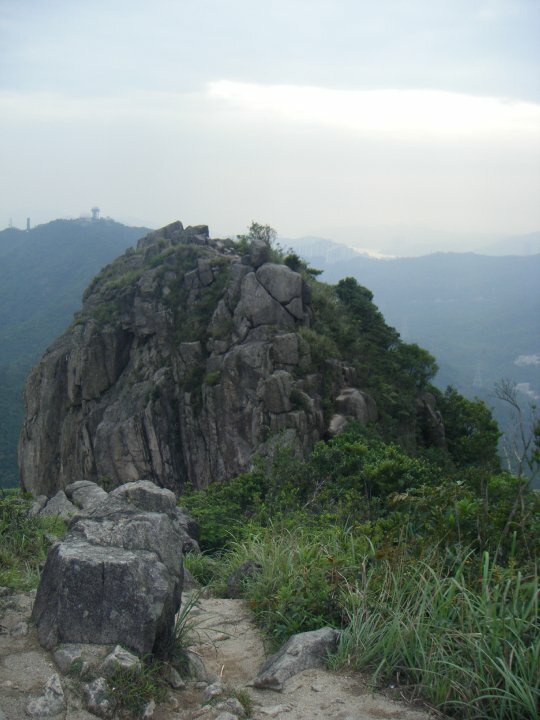 After that, we decided to climb Lion’s Rock, which also happened to be near Lok Fu. As we tried to figure out how to reach the trail for Lion’s Rock, this nice businessman, Benny, came out of nowhere, asked if we needed help, then led us towards the park since he was going that way anyway on his way home to his wife. It was completely unexpected and unasked for, but very welcome assistance. He was the nicest man and told us he’d worked in Canada and Hong Kong and was now the manager of bunch of malls in Beijing, but was back in Hong Kong again because the company he worked for was interested in expanding into Hong Kong from mainland China. Lion’s Rock. It doesn’t look intimidating from the top, but trust me, the climb up here wasn’t easy. Hong Kong from Lion’s Rock. Wow. Just wow. Eventually he left us and we found the park and began the long trek up. It was much longer than I expected, and by the time we reached the top (over an hour later), we were both sweating and worn out, but ultimately triumphant. The reward was some of the most stunning 360 degree views of Hong Kong I’d ever seen. I could see clear across the harbor to Victoria’s Peak, I could see the airport, I could see everything! It was absolutely breathtaking. By the time we made it back down to the bottom of the trail my legs were shaking a little from all the effort, and as a reward for a hike well done, Nish (pronounced Neesh – my friend) and I went and had coffee at a nearby mall and ended up comparing growing up in the USA versus Australia until 9 o’clock that night, when we finally said good-bye and I headed home for HKUST. Saturday was another perfect weather day, and the day my friends and I finally exploredLantau Island – home to the famous Big Buddha! The group, which started out smaller, turned into twelve people by Saturday morning – me, Abby,Ilaria,Ilaria’s friend Veronica (visiting from Italy), Jane, Bryan, Kevin, and a bunch of my new Iranian friends – Ali, Mahdi,Hooman,Pejman, and Mohsen. The gang’s all here. We should have tried to orchestrate a jumping picture. 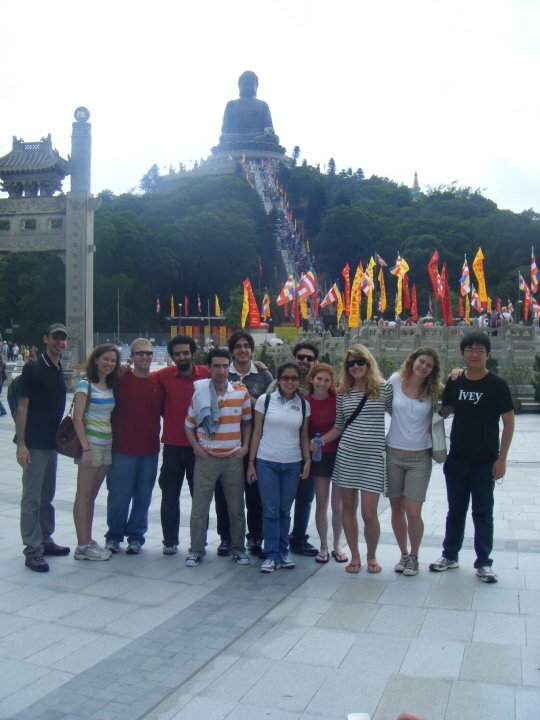 We all headed out on the MTR, took a ferry over to Lantau Island, then a bus to the Big Buddha at Ngong Ping. The first thing we did atNgong Ping was to have lunch at the Po Lin Monastery which served up some of the best vegetarian food I’d ever had (no lie – and this comes from a self-described carnivore). Everything was delicious, and I can’t even tell you half the things I ate, but it was very satisfying and you almost wouldn’t know there was no meat included. Then we explored the temple on the main grounds – it was gorgeous and everything was in full bloom around the temple making it even more picturesque. Finally, we headed for the Big Buddha itself. The hike up the steps to the Buddha was a short one, and with each step, this statue just got more and more enormous! I nearly fell over backward craning up to look at it properly at the top! It was so BIG you can’t imagine, and the views of the islands and the cable car (yes there was a cable car onLantau) and the mountains surrounding the Buddha werepriceless! Words and pictures just didn’t do it justice; it is something to see in person. 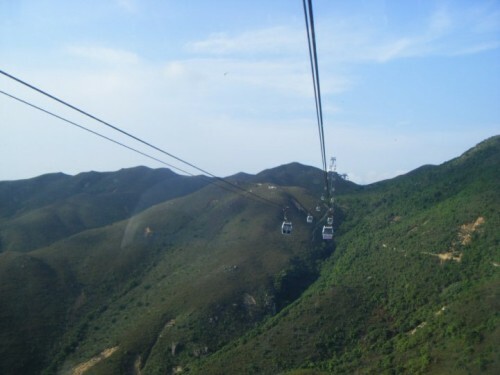 One of the many amazing views from Lantau’s cable car. Sweet. Once we were done snapping photos on top of the Buddha, we headed over through Ngong Ping Village (the biggest tourist trap I’d seen since coming to Hong Kong) and road the cable car (again, more breathtaking views) back to the MTR station in Tung Chung and caught the subway back to campus. And this was just Friday and Saturday afternoon – the weekend was still young with much more to come. Stay on the lookout for my next post rounding out Saturday night and Sunday. Hint: beach parties are involved! Surprisingly (or perhaps not), the deep fried taro puff was not the favorite vegetarian dish at our table. This entry was posted in Asia, Hong Kong and tagged Asia, Buddha, Hong Kong, Lantau, Lion Rock, Lok Fu, Travels on April 23, 2014 by Paige N..